Zara is praying at night. Kabir says I know what you are praying for. Zara and Alina offers namaz at night to do isthikara. Alina prays to get a husband who respect her and her family. Zara prays to God to make her follow right path and give her strength to fight for women. Kabir looks on. Zara says Alina is doing isthikhara too, if God gives her hint to choose Amir then what will you do? Salma calls Zara and says stay away from Alina’s trouble, her parents can decide for her. Zara says they are marrying her to person she doesnt like, I am walking on path of truth, I am sure God will give me a hint, she ends call. Kabir looks on. Kabir is awake at night and thinks what if God hints towards Amir? In morning, Kabir comes to Zara and thinks what did she see in istikhara. Zara says I didnt get any dream last night, I am already doing what God wants me to do, if Alina gets hint towards Amir then I will fight for her and I dont want my family to do a sin. Kabir says I wont let this love marriage sin to happen in this house, alina will marry Anas only, you can do anything you want. Ayesha shows jewelry to Alina and gives her bank account. Alina says what is this? Ayesha says I used to save money for you, this is all for you, we dont want wrong for you, Anas is a good boy for you. Alina says I did istikhara last night and God hinted towards Amir. Ayesha glares at her. Zara comes there. Ayesha says you gave her this idea? I did istikhara and got Anas’s name. Zara says you both kept one choice over other so you got that hint, she asks Ayesha and Alina to give chance to both Anas and Amir and then do istikhara again. Ayesha says dont teach me, I asked you to stay away from Alina, Anas’s family is coming so dont come out. She makes Zara leave. Zeenat calls Salamat and says I played a trick, I messaged Alina as Amir and Alina ranaway, all are blaming Zara. Zara comes there and says you messaged Alina? Zeenat says I did. Zara says you are not scared of God? Zeenat says Alina will marry whom we want her to marry. Zara comes to Kabir and says Zeenat is still playing tricks, she messaged Alina. Kabir says Zeenat was saying same thing, I wanted you to be in function with me but you want to challenge me. Zara says no, I just want you to think about Alina’s life. Ayesha comes there and says Kabir Anas’s family is here, she asks Zara to stay in room. Kabir says but. Ayesha says I dont want any drama. Zeenat comes to Alina, Alina thinks that Zara wont be in function so I have no one on my side. Zeenat says your mother is very worried about you, think if you say no to this relation then Ayesha will throw Zara out, dont break her relation with Kabir, dont do any mistake. Alina comes in lounge. Anas smiles at her. Asad asks Kabir where is Zara? Zeenat says she went to her parents’ house. Kabir says she is here only, actually she doesnt accept this relation thats why she is not here. Asad says everyone has an opinion but all should be here. Anas says I want everyone to forget about their anger, I want everyone to be part of my marriage. Kabir says I will bring her, he thinks that Alina will marry where I want. PRECAP- Zara says to guests that Islam doesnt allow to force girls to marry, did anyone ask Alina where she wants to marry? Ayesha says to Zara that we cant bear you anymore, you wont stay here. Kabir throws Zara out of house. Zara cries. 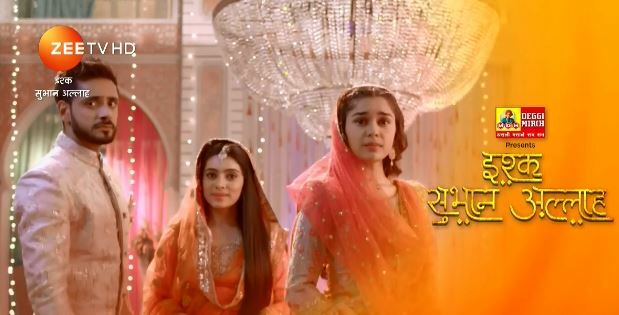 The post Ishq Subhan Allah 25th February 2019 Written Episode Update: Ayesha banishes Zara appeared first on Telly Updates.